The Arduino Ethernet board is like an Arduino Uno and Ethernet shield, but without USB. This article shows how to program, test and use the Arduino Ethernet board and what accessories are needed. The video below compares the Arduino Ethernet board with an Arduino Uno and Ethernet shield. It then shows the Arduino Ethernet board being programmed and used in a stand-alone configuration with an external power supply. The Arduino Ethernet board is shown below. It has an RJ45 Ethernet connector, power connector, connector for an external USB board for programming and micro SD card socket. It is important to note that the board does not have USB on-board. 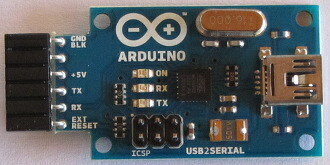 An external USB to serial board is required to program the Arduino Ethernet board, such as the Arduino USB2SERIAL board. The USB2SERIAL board also supplies power to the Arduino Ethernet board so that no external power is required while developing software and while the USB2SERIAL board is plugged in. The USB2SERIAL board connects to a host computer using a USB Mini Cable. The USB Mini Cable has a miniature connector unlike the standard USB cable required for the Arduino Uno. 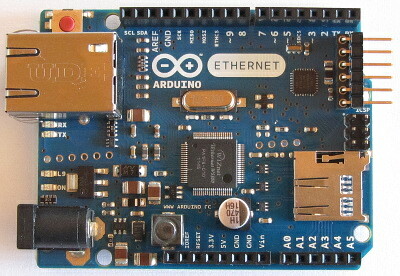 The Arduino Ethernet board is suited to applications where an Arduino Uno and Ethernet shield would be used, but the USB connection is not needed. The best cost saving would be reached if more than one Ethernet board is needed in a project. A single Arduino Ethernet can then be used to replace an Arduino Uno / Ethernet Shield combo. Only one USB2SERIAL would be needed to program all Arduino Ethernet boards for the project. After getting an Arduino Ethernet board and USB2SERIAL board, you may want to test them before using them in a project. Before loading any sketch to the Arduino Ethernet board, remember to select Arduino Ethernet under Tools → Board in the Arduino IDE software. The first and most basic test is to run the Blink example program found under File → Examples → 01.Basics → Blink in the Arduino IDE. Loading and running the Blink sketch will test that you can upload sketches to the Arduino Ethernet board and test the LED. Before running the Blink sketch, you will need to modify it because the LED is found on pin 9 of the Arduino Ethernet board and not on pin 13 like the Arduino Uno. You can modify the sketch from the IDE or copy the modified Blink sketch below and paste it into the Arduino IDE. Do the same test as shown in the article on plugging in and testing the Arduino Ethernet shield. You will of course need to plug the USB2SERIAL board into the Arduino Ethernet board to load the sketch and do the test. To test a micro SD card and card socket on the Arduino Ethernet board, do the same tests as shown in the article on testing the SD card on the Arduino Ethernet shield, but use the Arduino Ethernet board with USB2SERIAL board plugged in.